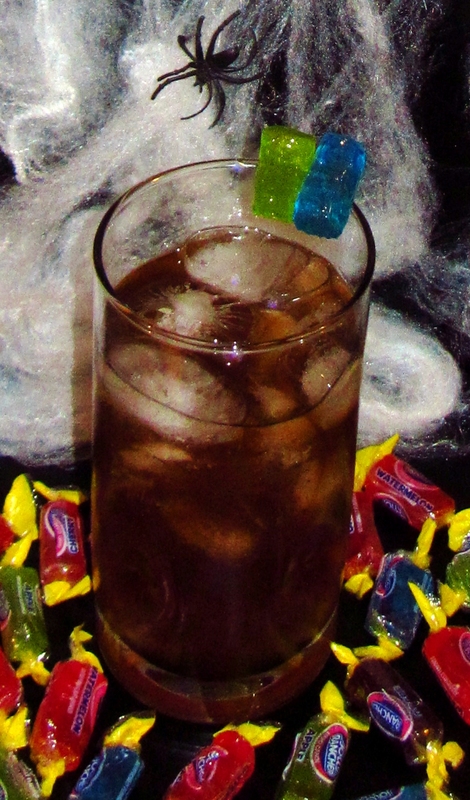 Well friends, the week you’ve all been waiting for is finally here: Candy Cocktail Week! Today we take a crash course on the candy industry thanks to a wonderfully crafted infographic. This proves once again that the Sip Advisor is the only education you need! When you go out and share your newfound knowledge with all you friends, just remember who made you the intelligent candy connoisseur you’ve now become… your welcome! Candy Cocktail Week got off to a great start with this drink that actually tastes like the candy. It was hard to get the usual sticky Jolly Ranchers to stay on the glass long enough to snap a couple photos, but I got it done. The Melon Liqueur was particularly nice in this recipe. The Chocolate PayDay bar has become a unicorn of sorts for myself and Mrs. Sip. We found it once, in a hotel vending machine. It was the last bar of its type in the machine and we’ve never seen it again. It took the classicly awesome PayDay bar – salted peanuts held together by chewy caramel – and covered it with chocolate. Had I not seen the bar with a witness, I’d begin to wonder if my years of drinking were taking a toll on the ol’ noggin. The Wunderbar is a favourite shareable for me and the little lady. Hell, she thinks every chocolate bar is a shareable… and don’t even get me started on our long standing McDonalds’ fries dispute (if I knew you were going to eat half of my fries, I would have ordered the larger size!!!). But I digress. I like to accuse her of eating more than her fair share of the chocolate bar and then she leaves me more the next time. It’s the ol’ bait and switch, executed to perfection! Twix is another perfect “sharing” bar that brings out the Cookie Monster in me. I hate when chocolate bars are hard to share, like what do you do with the third peanut butter cup (note: in the United States, packages come with two cups, but in Canada, there’s three… yup, we’re better! …never mind the fact that you can probably buy two U.S. 2-packs for the price of one Canadian 3-pack). Obviously, you can break the third cup in half, but then your fingers get all chocolatey and delicious and such. Perfect for wiping on your loved one’s finest clothing. I like the new line of Snickers “you’re not you when you’re hungry” commercials, as it’s always nice to see Joe Pesci in front of the camera again. Mrs. Sip isn’t a fan of Snickers bars, so I get this one all to myself! She doesn’t like Oh Henry!, either, so I bet you can guess which treats are well-stocked at the Sip Advisor offices… that’s right, not these ones. These are the delicacies I hide around the house – toilet tank, recycle bin, among the DVD collection – for when I’m not acting myself. They were 3-D first and we have to thank them for that. While travelling through Switzerland a handful of years ago, it seemed we were buying Toblerone bars like they were going out of style. When we took the trip up Jungfrau Mountain, we made sure to have this wonderful chocolate on hand, as eating some can actually help you adjust to the altitude. Either that or you need to down some serious wobbly-pops. Everybody has their favourite chocolate bar… what’s yours? I know it’s a hard choice to narrow down. Maybe it’s easier to pick one you hate. It is Fat Tuesday today, so make sure to enjoy as many bars (chocolate or otherwise), guilt-free, as possible! This actually tasted like a Skor Bar. I know that’s how it’s advertised, but sometimes the results don’t match the name. Butterscotch Schnapps and Crème de Cacao make an amazing pair and the Skor Bit rim was a lot of fun, too.